Premium LED COBs for building your own Grow-lights. EconoLux Industries Ltd. is the exclusive manufacturer of the MC and VXS series of plant-light-on-chip grow-light COBs. These COBs are scientifically designed to have a close match to the McCree Curve and natural sunlight. We also make custom COBs to suit your desired spectrum. EconoLux Industries invented and introduced the world's first McCree curve COB, with a 90+% match to the McCree curve, in April of 2017. Our unique Mc COB is based on our extensive R&D and our proprietary self developed phosphor technology. We can make this technology available to you to make your own grow-lights with a superior spectrum and PPFD. Choose the best COB for your needs, or have us custom design one to suit your requirements. EconoLux can design custom COBs to suit your needs and budget. In the past we have designed COBs with a 95% match to the PAR curve. We have designed special tomato growing COBs with a proprietary spectrum (as specified by the client) that increased crop yields by 18% to 22%. We have designed custom UVA COBS with wavelength output between 360nm and 395nm. We can designs any COB, either based on a conventional COB holders, or a PCB style COB. Please contact us to discuss your needs. The Mc Series of LED COBs are available in 100W and 200W models. 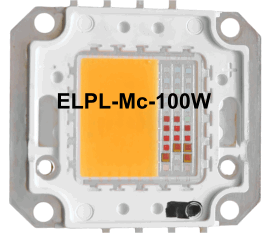 The ELPL-Mc-COBs are the only full spectrum LED grow-light-on-a-chip engines in the world that offer a 90% to 95% match to the McCree curve, and a close match to natural sunlight. The McCree curve represents the latest research in plant growing lighting, with a light absorption curve close to that of sunlight - see What Light do Plants Need? The McCree curve is ideal for 'full cycle' growing of all different kinds of plants, both leafy green types (Lettuce, Chard, Spinach, Basil & other herbs, Micro-Greens. etc.) and flowering/fruiting types of plants (Tomatoes, Cucumbers, Squash, Peppers, Cannabis, etc), as well as decotative and house plants. The ELPL-Mc Series of light-engines has a close match of 90+% to the McCree curve, as well as a close match to the spectrum of sunlight. The chart (right) shows the spectrum, with the McCree curve (as a dashed purple line - set to 90%), along with the spectrum of sunlight (solid red line set to 85%). 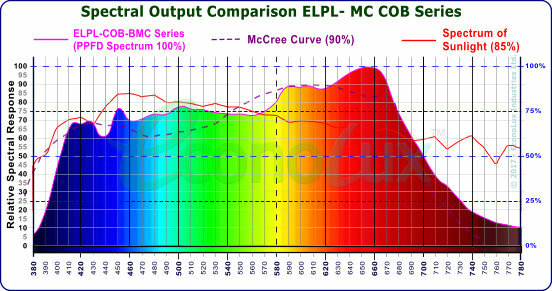 As you can see from the Chart, the ELPL-Mc series has a true full spectrum output. from 380nmn to 750nm. The Mc series COBs are the world's only LED light source with such a close match to the McCree curve. The graphs (below), from our plant/grow light spectrometer, measuring in PPFD (PAR)*, shows a comparisons of the ELPL-Mc 100W COBTM spectrum, to various standard curves for Chlorophyll A, Chlorophyll B, and Beta Carotene - the light absorbing compounds in plants responsible for growth. The MC COB grow light engine's match to these curves is very close due to the ELPL-MC COBs careful construction, and the use of our self-developed and proprietary Mc85 phosphor coating. #1 Note: These measurements were made at a distance of 15cm, (6") with no lens or reflector used. Readings will vary with distance from the COB, and the use of supplementary optics (reflector/lens). The spectrum of the COBs may vary by +/- 2.5% due to minor variations in the LED chips output. #2 Note: We use PPFD/Watt as most professional plant/grow light manufacturers provide the average PAR/PPFD and the actual power draw (wall watts), making it simpler to compare different lights (measured at the same distance from from the light to the PAR/PPFD meter). The VSX Series of LED COB series is a lower cost, but still close to a full spectrum COB light engine. It has an output from 400nm to 750nm with and 80+% match to the McCree curve .and a reasonable match to sunlight - see What Light do Plants Need? The VSX series is still suitable for 'full cycle' growing of all different kinds of plants, both leafy green types (Lettuce, Chard, Spinach, Basil & other herbs, Micro-Greens. etc.) and flowering/fruiting types of plants (Tomatoes, Cucumbers, Squash, Peppers, Cannabis, etc). Even thought it does not have as good a match to the McCree curve as the Mc-COB, it is still better than almost any "full spectrum" COB available on the market today. The VXS series of COBs is well suited for home growing and semi-pro growing applications. 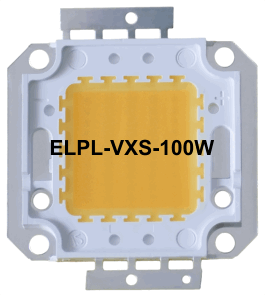 The ELPL-COB-VXS Series of light-engines has a reasonably close match to the both the McCree curve and the spectrum of sunlight - closer than any other "full-spectrum" LED COB on the market. The chart (on the right) shows the ELPL VFX Series COB grow-light engine spectrum (pink line with spectrum), the McCree curve (dashed purple line - set to 80%), along with the spectrum of sunlight (red line set to 80%). The Spectrum is only a poor match to the McCree curve inm the UVA abd deep blue region (below 400nm). The chart on the left shows the ELPL-VFX Series spectrum (pink line with spectrum), the McCree curve (dashed purple line at 80%), the spectrum of sunlight (red line at 80%) and overlaid with the spectrum of the most popular brand of "Full Spectrum" LED COB (black line). As you can see from the graph, the competitors so-called "full spectrum" COB is anything but, as it lacks significant light output in the 475nm to 580nm range, while the VXS series does indeed produce a full spectrum of light from 400~750nm, and is a closer match to the McCree curve than the so-called "full spectrum" competition. *Output (µ-mol/M2/S): Using a quantum PAR meter; with NO reflector or lens used. # Note 2: These measurements were made at a distance of 15cm, (6") with no lens or reflector used. Readings will vary with distance from the COB, and the use of supplementary optics (reflector/lens). The spectrum of the COBs may vary by +/- 2.5% due to minor variations in the LED chips output. The diagram below shows the power connections for the ELPL VXS and Mc series COBs. Care should be taken when soldering wires to the COB not to overheat the solder pads, and to use standard electrostatic precautions (EG: grounded wrist straps). EconoLux Industries is dedicated to serving your needs for scientifically designed, energy saving, Plant/Grow/Hydroponics lighting, with high PPFD/PAR output, and a close match to the McCree curve and natural sunlight, for cultivating all types of plants. Images and materials on this site are © 2012~2019 by EconoLux - or used by permission of their respective owners.